Start a mystical and mysterious journey through Egypt! 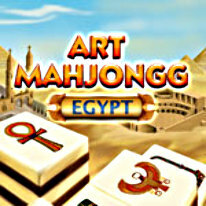 A journey full of adventure and hidden worlds awaits you with this entertaining mahjongg game. Explore the Sphinx and the pyramids or spend some time at the Nile, with options to play in either the relaxed free play mode or the more challenging and invigorating campaign mode. There are many levels of the classic solitaire-mahjongg with various tile structures to keep you entertained. You can find two special mahjongg variants in the free play mode, called "Flight of Horus" and "Pharaohs Mahjongg."